A young rocker, his heart still full of ideals, closes his eyes. He is confident, perhaps more than he should be, as he strums the first chord of the song. The music fills the air around him, spreading out to the audience and overwhelming what surrounds them. It's just the Young Rocker and his Music. Honestly... Drawing a guitar is hard. I think it came out pretty good. I kinda have a good idea for a country music star one. Might need to make that too. Also, this is the first time I'm gonna get to say it... CHALLENGE COMPLETE! Hahaha, I love his head sweatband! It's so 80's chic! thanks for accepting my challenge!! :D it came out so well! I think this is my favorite one. 'his heart still full of ideals' haha perfect! That's me, right there. Young, guitar, ideals. I feel so connected to you Young Rocker. I'm so glad hyperboleandahalf.com brought me here. is it ok to say that your guitar looks like a turd? Guitar is not very good. No argument. Turds look way different though. Cool drawing! The chicken rocks. 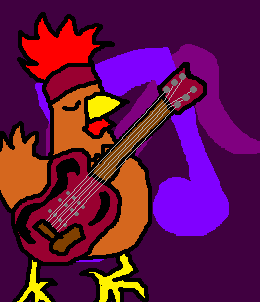 Love the chicken who rocks!